Albertosaurus mount at the Royal Tyrrell Museum. Photo by Dave Anderson, via Flickr. A hundred summers ago, an American Museum of Natural History team led by legendary fossil hunter Barnum Brown discovered a mass grave of the tyrannosaur Albertosaurus while traveling down the Red Deer River. This was, incidentally, the same scow expedition that inspired this year's sadly aborted reenactment led by Darren Tanke (which I hope will be able to be completed next year). Coinciding with this centennial, the newest issue of the Canadian Journal of Earth Sciences is dedicated to Albertosaurus. The fossils comprising Brown and company's discovery were not the first appearance of Albertosaurus in the annals of paleontology. The first remains, a partial skull discovered in 1884, were assigned by Cope to his invalid Laelaps genus in 1892, which was changed to Marsh's Dryptosaurus in 1904 by Lawrence Lambe. Henry Fairfield Osborn gave the animal its current name the following year in an early roundup of tyrannosaurs. Preying on the various herbivorous kinds were powerful flesh eaters. Albertosaurus... an active animal 30 feet long and about 15 feet high. Armed with large serrate dagger teeth and sharp, bird-like claws, it was capable of destroying any of its herb eating relatives It walked habitually on its hind legs, balanced by a long tail, while the short, reduced, front legs could have been used only in grasping its prey. The Albertosaurus posture he describes jibes perfectly with the modern image of theropods as constructed with paleontological evidence. But it would be several decades before it was accepted that theropods held their tails off the ground, balancing the weight of their business end - you know, the one with the jaws and great gnashing teeth. Arguably, he most significant contribution Albertosaurus has made to paleontology is the idea of some theropods as gregarious pack hunters, based mostly on the Barnum Brown bone bed. Phillip Currie of the Royal Tyrrell Museum and University of Alberta, and a main contributor to the new CJES issue, has been one of the biggest proponents of the hypothesis. He argues that Brown's site, home exclusively to about twenty Albertosaurus individuals ranging widely in age, was the result of a sudden event that killed all of the members of a pack. Currie offers the gracile, long-legged build of Albertosaurus as evidence that they were likely swift-footed predators, and pack-hunting would have been a good strategy to take down the large lambeosaurine duckbills their preyed upon. It's certainly an evocative idea. It's hard to imagine what it would feel like to watch a group of albertosaurs chase and bring down a Hypacrosaurus. Part of the allure of paleontology is this license to engage in fantasies like this, and while we'll probably never have definitive evidence of albertosaurs behaving in such a way, it's not completely implausible. All we have are hints into a lost world. Paleontology is a journey without end. Paper-folders of the world, hear these words and drink of their meaning. Never, I implore thee, stop making origami dinosaurs. From the flickr photostream of Phillip West. Don't be shy. Check out his other work and give him a big old digital bearhug. Sarcosuchus skull with hominid for scale. From the Royal Tyrrell Museum flickr photostream. Sarcosuchus imperator, popularly known as "Super Croc," was an Early Cretaceous crocodile from Africa that grew to about forty feet long. That's about as long as a T. rex. It's also the subject of one of several National Geographic specials recently added to Netflix's instant play service. It covers paleontologist Paul Sereno's progress as he excavates a Sarcosuchus skull in Niger, then attempts to build a reconstruction at his lab in Chicago. Along the way, he tags along with herpetologist and Nat Geo personality Brady Barr capturing crocodiles in Costa Rica and gharials in India (which sound like enraged weed whackers when snared). It's a glamorized version of paleontology, but it's packed with great crocodile footage and covers just about every aspect of their physiology. The CG Sarcosuchus leaves a lot to be desired, but Sereno's model, sculpted by Gary Staab, is pretty awesome. Other Nat Geo paleontology title recently added to Netflix include the pterosaur special Sky Monsters, the asian dinosaur specials Dinosaurs Unearthed and Dinosaur Hunters: Secrets of the Gobi Desert, and the seven part series on Cenozoic mammalian beasts, Prehistoric Predators. One of the most dependable blogs in my Google Reader design and illustration folder is Agence Eureka, which collects old and obscure French children's literature, textbooks, and activity books. To regular LITC readers, it's not so surprising that I'd be so smitten with this sort of stuff. The latest post features illustrations from the title Les Vacances Fantastiques, written and illustrated by Guy Sabran. The story involves the Casseboufige brothers getting into some hi-jinks with underground dinosaurs. They look like weird sauropods with facial fins. Head over to Agence Eureka to check it out. It wouldn't hurt to hit the "follow" button or add it to your RSS feed-o-matic of choice. Here are a couple sneak peaks, from the Agence Eureka flickr photostream. You may have heard of University of Toronto PhD candidate Todd Reichart's successful flight of his human-piloted ornithopter, the Snowbird (video here). Radio-controlled ornithopter construction has a long history among engineering hobbyists, and luckily for us, many of these folks have turned their attention to the first vertebrates to evolve the ability of flight, the pterosaurs. Kazuhiko Kahuta has uploaded a number of test runs of his Mesozoically inspired ornithopters to YouTube. Here are a few choice cuts. This Pteranodon has a particularly nice flight. Wouldn't it be funny if there was a cryptozoologist on the other side of those trees, babbling excitedly while taking video with his phone? 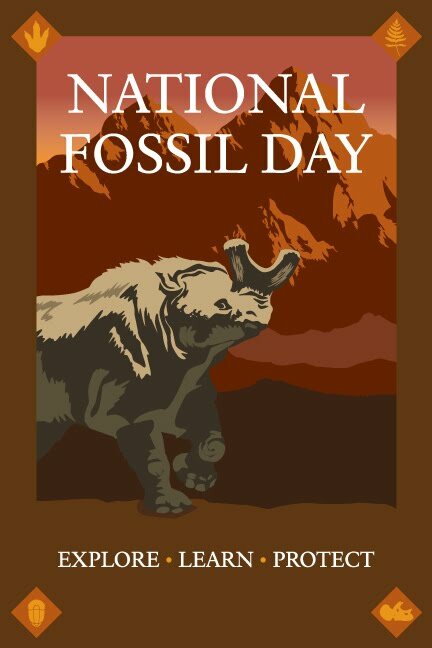 October 13 is National Fossil Day in the U.S. The National Park Service has announced an art contest held in conjuntion with the event. The National Park Service and National Fossil Day partners are sponsoring an art contest to celebrate the first annual National Fossil Day. 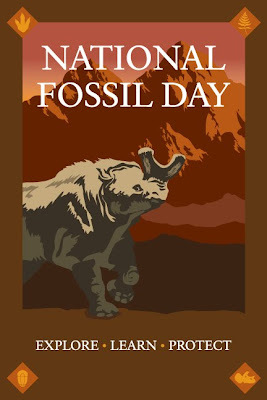 National Fossil Day is scheduled for Wednesday, October 13, 2010, during Earth Science Week. 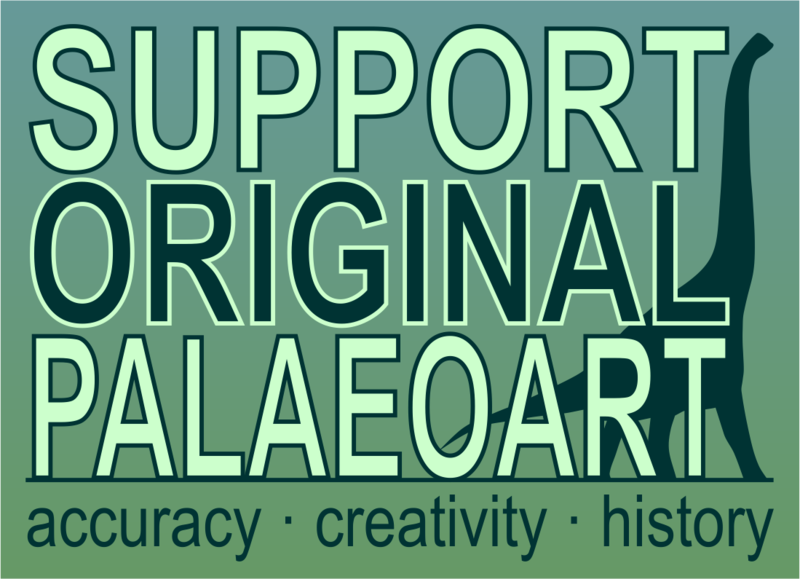 The theme for this contest is: "Paleontology: Preserving the Past for Our Future." ...This contest is about portraying the importance of fossils and what we should do to preserve them. Artwork should focus on fossils and their effects on the world in the past, present, and future. The artwork can be in the form of a photograph (black & white or color), a painting, a drawing, or a sketch. All artwork must be 2D and flat. Head here for more details and an entry form. Head to the main Fossil Day site for more information about the event and other ways to participate. Too much great stuff happening right now! Generally, children can be counted on to have a fairly robust interest in dinosaurs. They also like stickers. Today's title, The Nature Sticker Book of Dinosaurs, combines the two in a stroke of genius that probably still elicits fond memories of the day it struck one of the enterprising executives of Offenheimer Press. I envision two elderly gentlemen relaxing after a round of golf, sipping bourbon. "Remember that dinosaur sticker book, Jimmy?" "Yeah, Roger. I sure do." "Hell of an idea. Hell of an idea." "Those were our salad days," Jimmy muses as he watches the rich amber libation swirl in its glass. I wouldn't be making up imaginary conversations between this book's publishers if it was the flashiest title ever. It isn't. Just workmanlike depictions of dinosaurs that don't fuss over minor considerations like anatomical accuracy (a Pteranodon is thrown in for good measure, natch). 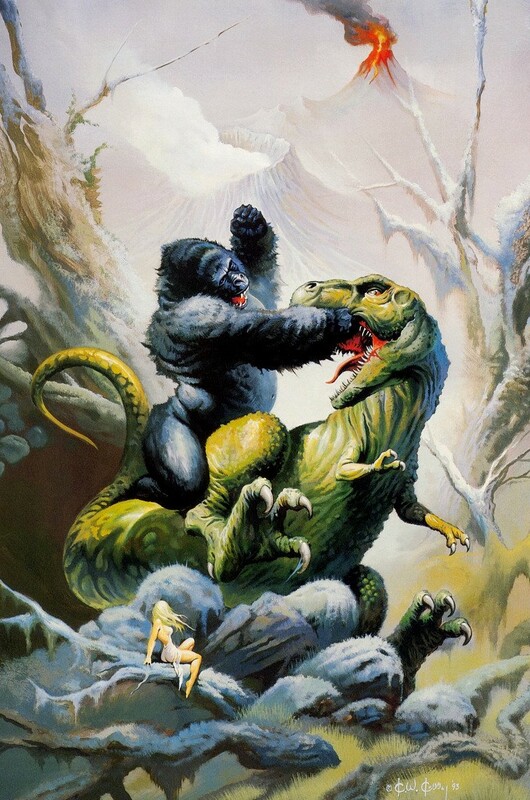 Though it was published in 1988, James Seward's dinosaurs are decidedly pre-renaissance. 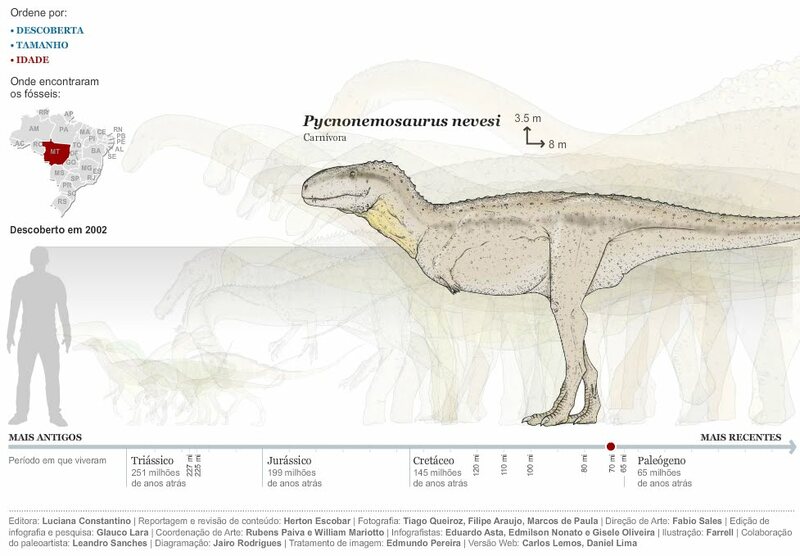 Allosaurus and Tyrannosaurus walk with the old "man in suit" posture. The sauropods dutifully hang out next to or wade in bodies of water. When looking into James Seward on-line, I mainly got results for a prominent painter of Christian art. He also buttered his bread with various commercial publishers, so I imagine this is one of his projects as well. It may be a project he revisited, if this Amazon listing is correct. the only other James Seward I found would have been too young to have done this, unless he was a Mozart-like prodigy. Not impossible, just really implausible. To answer the question that's surely burning a hole in your cranium: No. None of the stickers were left by the time I picked this up secondhand. As ever, you can check out more from this book and many others at the Vintage Dinosaur Art Flickr pool. The good folks at ART Evolved have organized a fundraiser for breast cancer research. It runs from now until the end of October. One way to help out is to submit your own artistic version of a pink dinosaur (I bet they wouldn't turn away pterosaurs, mosasaurs, or thecodonts, either). For every one they recieve, ART Evolved's administrators will donate a dollar to the Canadian Cancer Society. If you're shy about sharing your drawing skills with the world, don't worry. You can support the cause by donating directly at ART Evolved's Pink Dinosaur Event Page. They have set a goal of $500, but I bet we can top that. In addition to the numerous fossil and mineral vendors, the Falls of the Ohio Fossil Fest was also attended by local organizations dedicated to natural history outreach and education. The Kentucky Paleontological Society had a particularly wonderful set of locally gathered fossils in display cases. I was impressed with the care taken to identify and prepare them. Fossil prep is one of those sweet spots where art and science meet, and it was clear that some strong TLC went into these. KPS president Dan Phelps presided over one of the day's four presentations on local natural history, giving an informative, often humorous overview of Precambrian fossils. He also brought along an impressive collection of them, which people were pretty excited to get to examine up close. Unfortunately, my low-light photography skills are pretty rotten, so I don't have many good shots of this part of the day (save for the Australian stromatolite below). The KPS is providing a valuable service to the region; I was stunned to learn that Kentucky doesn't actually have a natural history museum. I talked to Phelps about this sad fact, and with a slight note of bitterness, he quipped that the state could only boast a "supernatural history museum." When I first posted about the festival on Monday, I wrote that there would be a weeklong series on it. As I thought about it more, I decided that going forward, it would be more appropriate not to fold those sort of posts into this blog. One of the takeaways from the festival was how much of a need there was for more of a web presence dedicated to Indiana natural history, especially something more 2.0. We need a flexible, dynamic way for people to share what they know and further educate themselves. As a first step, I've begun another science blog. It's called Under Indiana, naturally, and I'll be doing all of my local interest writing there, unless some nutty farmer overturns everything we know about Indiana geology by finding a pterosaur on his land. Feel free to follow me there, if reading about natural history of a smallish midwestern state gets your kettle boiling. There's not much there yet, and I probably won't be posting as much as I do here. But I'm as dedicated to making it readable, fun, and informative as I am here. If you're ever tooling down Route 19 in Spring Hill, Florida, make sure to pause to admire this old Sinclair station. Photo by Rusty Boxcars, via flickr. I can't get enough old Sinclair stuff. More here and here. After tossing about ideas for the title of this blog for a while, I settled on a twist on the title of Gabriel Garcia Marquez's Love in the Time of Cholera. I then had to decide between dinosaurs with a nice hard "C" at the beginning of their generic name. There were some good ones. I ultimately chose "chasmosaurs" because I've always liked the name, and I liked that it wasn't a single dinosaur, but rather a whole tribe of ceratopsids, always one of my favorite groups. In contrast to their centrosaurine relatives, the chasmosaurine ceratopsids are distingushed by larger brow horns and frills. Today, a team of scientists led by Dr. Scott Sampson has published a paper in PLoS One, revealing two new members of the chasmosaurine line: Kosmoceratops richardsoni and Utahceratops gettyi. They were denizens of the southern part of Laramidia, a small continent formed by the sea that clove North America in twain during the Late Cretaceous. Kosmoceratops sported especially odd headgear: long, sideways-pointing brow horns and swept-forward spikes lining the top of its frill. 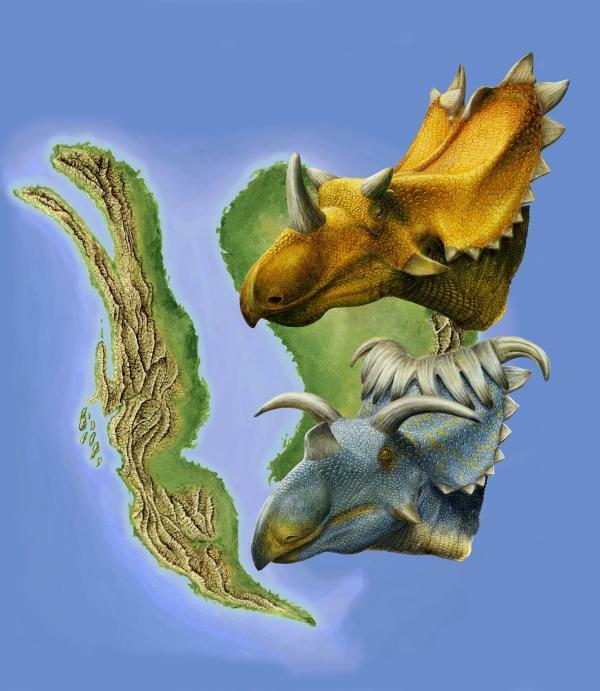 Utahceratops and Kosmoceratops with a map of Laramidia. Copyright Lukas Panzarin, provided by the University of Utah. As you would expect from research led by Dr. Sampson, the paper concerns itself with larger issues of dinosaur ecology. The authors present a convincing scenario of two coexisting lines of chasmosaurs, one in the north and one in the south, separated by an as-yet unknown barrier. Laramidia was a strange place. There was a narrow strip of land crammed between the sea mentioned earlier and a great mountain range containing the future Sierra Nevadas (the Rockies were only just beginning to form). Most of the North American late cretaceous dinosaurs we know are from this ribbon of low-lying land on Laramidia, a veritable dinosaurian paradise. This is the big, exciting question the paper asks. Why was there such a stunning diversity of dinosaurs in such a small area? I'm looking forward to more discoveries, and more reconstructions by Lukas Panzarin. Dude's got skills. This is the beginning of something very, very cool. Here are two recently uploads to YouTube from John Conway's Ontograph Studios. First, a 360 degree view of a Nyctosaurus flock. Next, this incredible zoom. Don't see pollen in this picture? Just wait. In an illuminating interview with Conway at Archosaur Musings, the artist says it's made of a "series of paintings done in Photoshop at successively smaller scales, then stitched together and animated in After Effects." I can't wait to see more. More John Conway here and here and, of course, here. This is the first post in an ongoing series I'll be dedicating to the natural history of my home state of Indiana. I'll be calling it Under Indiana. Locals who remember the "Wander Indiana" jingle can feel free to get it lodged in their noggins. This weekend, I attended the Fossil Fest at Indiana's Falls of the Ohio state park. It's located in Clarksville, right across the river from Louisville, and has hosted the festival for sixteen years. This was my first. I was quite impressed with the dedication to natural history here; along with the Indiana State Museum, it's one of the only places in Indiana dedicated to interpreting the state's deep past. Volunteers were there in abundance to explain the ecology, the history of exploration of the site, and especially the fossils. This photo shows the park's claim to fame. At this site, the Ohio River has exposed a nice stretch of Devonian limestone dating to about 380 million years ago (with limited exposures of the older Silurian and younger Mississippian). It was a good year to pick as my first visit, I was told: the river is low right now, meaning that the Indiana shore, on the interior of the dam you see in the background of the photo, is easily reachable on foot. The shore is divided into an inner bank, the Indiana shore proper, and the outer bank, which sits just under the dam. The outer bank is home to the best fossils, and that was the destination of the hike I joined early in the morning. About two dozen folks joined in, all from varying backgrounds and levels of knowledge. The hike was led by volunteers with the park's Naturalist at Heart program who were generous with their knowledge and their time. I also hung out with a party from Kent State University's geology department. It was great to hang back and listen to them discuss what we were seeing, and fun to offer a couple tentative interpretations of some of the features. I was thrilled that I wasn't laughed off the bedrock! The hike had a wet start, as we had to ford a small part of the river and make our way across the dam. Once we reached the outer bank, the group separated out as individual fossils demanded our attention or the viewfinders of our cameras. There were so much fossil coral that it was very easy to imagine the floor of the shallow tropical sea where they originally grew, so many ages ago. I just noticed the spider in the photo above, a reminder that fossils aren't just baubles for human enjoyment, but are still part of their living surroundings. The most common fossils in this spot are the horn corals, so named because early American settlers mistook them for fossilized bison horns. Here's a Petoskey stone in its natural, unpolished state. Keen eyes could also spot the occasional bryozoan peering out from the limestone. Stay tuned for more photos from the Fossil Fest and discussion of the event and the natural history of the area all this week. UPDATE: Check out my second post on the Fossil Fest for more Indiana prehistory, and to learn about my new Under Indiana blog. The Berenstain Bears series of books were some of my favorites as a kid, and almost certainly one of my big influences as a cartoonist (though not responsible for the mediocrity of my cartooning, natch). I was also a connoisseur of Happy Meal toys from McDonald's, and I remember the Berenstain Bears set getting more than their fair share of use. In my estimation, they occupied the highest tier of Happy Meal toys, a position they shared with the exquisite Muppet Babies figurines. McDonald's wasn't the only fast food establishment to profit from a partnership with the Berenstain cabal. Long John Silvers issued a set of dinosaur books, including today's addition to the Vintage Dinosaur Art pantheon, Michael Berenstain's King of the Dinosaurs: Tyrannosaurus rex. It's part of his "I Love Dinosaurs" series, which was reprinted by Long John's for this promotion. Michael, son of Stan and Jan, was on his game here, and without looking at the cover or title page, there's no missing the influence of his parents. My favorite part of this title is just how astonished these dinosaurs look. Notice the ankylosaur in this next image; he wouldn't be more surprised if David Bowie had just strutted in, in full Aladdin Sane regalia. Even other members of the lead character's species are nonplussed by the high dudgeon* of the heavyweight champion of tyrant lizards, recoiling before the sight of his flesh-shredding teeth and the reek of his breath. Of course, even T. rex is caught off guard by the ultimate buzz-kill, the asteroid. This is the ultimate "aw, crap" moment. Berenstain wisely closes the book with a mournful T. rex contemplating the end of the Mesozoic. Hopefully this won't be the last time the Berenstains pop up here... I'm on the hunt for this title as well as this one. I remember owning the latter back in the day. Letting it slip from my possession is one of the more prominent shames in my already shameful life. *I'll never relent in my quest to install this as a catchphrase on par with "All your base are belong to us." Not included in the screencap are such gems as "dinosaurs are a hoax" and "dinosaurs are oil." This doesn't, of course, mean that each of these search terms arise from people looking to confirm their own beliefs. And Google's ranking criteria are famously opaque. But just in case, I'll try to elbow my way into these search results. Dinosaurs are Jesus ponies! This is a pretty funny joke about creationist attempts to square the geologically calculated age of the Earth with whatever arbitrary method they've pulled from the Bible. Join the facebook group or buy a tee shirt. Dinosaurs are fake. Okay, sure. Be that way. If you really, truly believe this, it indicates a pretty sharp divide between our respective worldviews. I don't have much to say other than that I personally trust in the methods of science to reveal as much about the natural world as the limits of human perception and technology can allow. If you want to say that dinosaurs are fake, that the moon is an especially sizable portion of Vermont cheddar, or that reality is an elaborate simulation made to keep up us placid while sentient machines harvest us for energy, have at it. Dinosaurs are still alive. In a sense, yeah. The weight of the scientific evidence shows that birds are the descendants of theropods. Where does the dinosaur end and the bird begin? After all, evolutionary theory has demonstrated that we're all descended from a common ancestor, so drawing the line between two directly related lines of organisms is pretty arbitrary. But it's a useful tool for discussing forms of life, and sometimes it's just as useful to say "humans are apes" or "birds are dinosaurs." Dinosaurs aren't real. See "dinosaurs are fake." Dinosaurs are birds. You've flipped the two critters here. Birds have a dinosaur ancestor, as it says above, but that doesn't mean that all dinosaurs were birds. There were even very bird-like bodyplans in dinosaurs that can only be considered their cousins. Dinosaurs are a hoax. See "dinosaurs are fake." Dinosaurs are oil. Think smaller. A popular misconception because of the term "fossil fuel" and the old Sinclair logo. Oil is derived from ancient organic matter, and it takes a heck of a lot of biomass produce the petroleum we've been chugging in huge quantities for the last 200 years or so. Coal is derived from swampy forests and shallow seas about 350 million years ago. Oil comes from ancient zooplankton and algae which accumulated on the seafloor over huge amounts of time, mixed with mud, and were buried under ever greater amounts of sediment. In order for there to have been enough dinosaurs - or any other large animal life - to create that much oil, they would have to have been literally tripping over each other or piled high. That's just not how ecosystems work. The majority of life in an ecosystem is going to be the small, humble things that can turn the sun's energy into food. That's where your fossil fuels are going to come from. Not from dinosaurs. Unless you consider them... (cue fancy fairy-dust chimes from all those soft rock ballads) fossil fuel for the imagination. Dinosaurs are sweet. Yeah, duh! Dinosaurs are awesome. Among the most awesome of awesome things! Yesterday on the Dinosaur Mailing List, Dr. Tom Holtz of the University of Maryland - a familiar face to viewers of most of the recent dinosaur documentary series - linked to a Brazilian news website's story about a new titanosaur. Its head is intact, a rare and significant occurance when a new sauropod is discovered. Certainly, a notable story worth reporting. The problem is, the paper describing it has not been published yet. In fact, it's not even been accepted yet. This is a faux pas on the reporter's part, and to his credit he has publically apologized to the authors of the paper. Because of this, I'm not going to write much about it, and I'll wait until the paper has been published. So why post at all? As part of the story, the website in question featured a set of interactive infographics. Check them out here. These are probably the best infographics I've ever seen attached to a dinosaur story. It's simply fun to use them, to mouse over and see what information pops up or what skeletal features are highlighted. 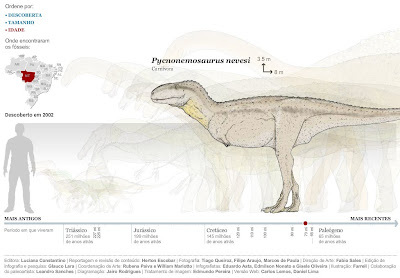 The illustrations for the "Dinosaurs of Brazil" tab are beautifully done, and can be reshuffled by size, time of discovery, and geological age. On top of that, mousing over a particular dinosaur displays a small map with the region of Brazil where it was discovered. Another tab called "The Story of a Fossil" looks, at first glance, to be a simply "layer cake" geological diagram with a friendly sauropod stopping for a drink at a lake or river. Clicking an arrow icon on the right-hand side moves you forward in time to see the dinosaur scavenged by theropods, buried, and fossilized. Extremely, superlative-defyingly cool. This is exactly the sort of stuff I want to see more science graphics do. Quick heads up: Today is a one day only 60% off sale at Indiana University Press. They've published loads of good titles on natural history. 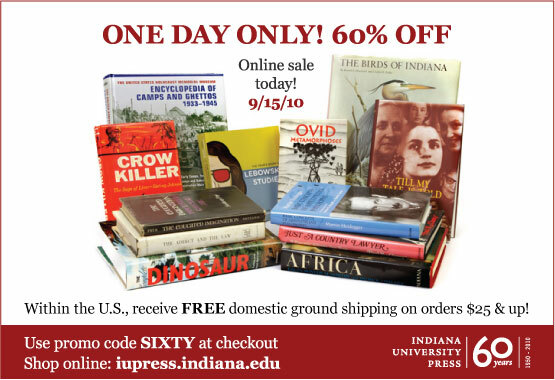 Head on over and burden your sagging bookshelves even more. By Ken Kelly. From Illustrateurs by way of Michael Rackin' Frackin' May. I'm stretching the boundaries of this blog today to the wider topic of geology, but you can't really avoid an appreciation of geology if you care about the deep history of life on earth. I've been following the photostream of Jake Sargeant for several months now, and it's always a bright spot to a day when he uploads a batch of photos. Recently, they've been coming from New Zealand. These photos capture exactly what I love about geology. More specifically, what I love about rocks: they tell a story. Not a day goes by that I don't dream of getting away to the desert or the mountains, that I don't have some tactile memory of the granite monoliths of Joshua Tree or imagine my bare feet on some distant stretch of sandstone. All are copyright Jake Sargeant, natch. If you like these, let him know. That's a Miami Sound Machine reference. I usually footnote the odd references in my post titles, but I feel like this post will be much more fun if you have that song in your head. If you're having trouble summoning the tune - or if you sadly aren't familiar with the aural wizardry of the Sound Machine - here's the video. If anyone would be able to deal with the burden of three extra syllables being added to a song, Gloria Estefan would be the woman. Play it and read. I am a little late to the Concavenator party, but I'm usually late to social functions in off-line life, so it's not stressing me too much. In case you haven't heard yet, Concavenator is a very cool, weird early Cretaceous theropod from Spain. Described in Nature by Francisco Ortega, Fernando Escaso, and José L. Sanz, it's the second strange theropod described in the last few weeks, and like Balaur, it's going to be the subject of debate for a while. Judging by its presence on the blogosphere and the conversation surrounding it on the Dinosaur Mailing List, it's making a much bigger splash than the island-dwelling dromaeosaur did. The reason for this is probably its hump. Its hump and its possibly feathered forelimbs. Mostly though, the hump. People seem to love the hump. Concavenator corcovatus by Raúl Martin. From the Nature paper. Concavenator possessed elongated neural spines - those are the vertical protrusions on top of its vertebrae - right above the hips. This isn't the sort of sail that Spinosaurus would have had on its back; rather, it's more like a "fin," tying nicely into the fact that Concavenator was a carcharodontosaurid (that's seven syllables, if you weren't counting), the "shark tooth" relatives of Allosaurus who grew to enormous sizes in the Cretaceous before being replaced by giant tyrannosaurs and mid-size abelisaurs. It would have made for an odd-looking theropod, but at this point, ornamentation like this isn't shocking. 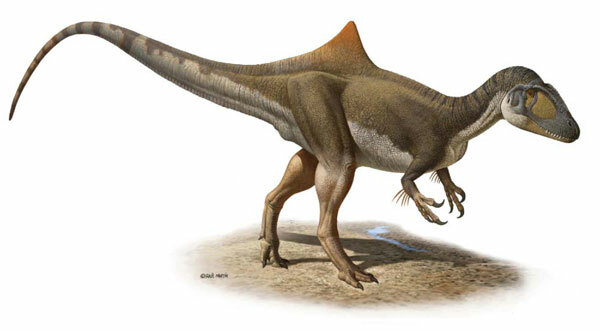 The really big news here is that Concavenator may have had quills or feathers on its arms. There is a line of bumps on its ulna - one of its longer arm bones - which look like the anchors for long flight feathers in modern birds, so the authors of the paper describing Concavenator propose that it had some sort of feathers or quills on its arms. This adds evidence to the idea that feathery, quilly, downy, filamentous body covering may have been a more basic trait of the dinosaurs than imagined. The image of dinosaurs as scaly beasts has been dead for a long time, of course, with multiple discoveries of skin and feather impressions. Ornithischians with quill-like features have been found, and the theropod clade known as the coleurosaurs include many feathered examples, and eventually spawned the modern birds. But carcharodontosaurids like Concavenator are carnosaurs (that's five hard C's, if you weren't counting), the sister clade to the coleurosaurs. It suggests that even earlier theropods could grow this kind of integument. So, too, may have the earliest dinosaurs. It's an open question, but daring paleoartists have some plausible grounding for clothing all sorts of dinosaurs in quills and feathery garments. Dissenting voices have arisen in the days since the paper was published, proposing that the bumps may better be explained as being the line where muscle attached to the bone. It will just take more analysis, and hopefully some new, similar, dinosaurs to be found. I absolutely relish good back-and-forths like this in paleontology; while the argument itself may not be settled soon, I always come out of it with some new knowledge about evolution or anatomy. Just don't get too used to saying Concavenator. It looks like this beast has already been named, from an earlier discovery of those hump-forming vertebrae. That name is Becklespinax. More on the quill knobs: Dots in Deep Time, Tetrapod Zoology. More on Becklespinax: Tetrapod Zoology also covers this in detail; the Theropod Database Blog's first and second posts. Two spinosaurs chat about good fishing spots. Illo by Susan Swan. Vintage Dinosaur Art posts have been heavy on the historical stuff lately, but now that I've got a new scanner and it's hooked up and humming, I'm digging into the stack of old dinosaur books I have sitting on my ancient CPU. One of the reasons I started this series was to bring light to artists whose body of work isn't defined by prehistoric worlds, who may have only dipped into dinosaurs for one or two titles. Susan Swan is a good example of this. Dinosaur Mysteries, published in 1980, features a lot of her artwork. The highlights are her watercolor scenes of Mesozoic life. Here's a good example: A Tyrannosaurus takes an ankylosaur's tail club right to the kisser. My sympathies lie with the tyrant king here - it looks like he was about to ask for a cup of sugar, and he seems quite nonplussed by his counterpart's high bludgeon*. The book is, of course, dated. See the image from the top of the post, which comes from a time when Spinosaurus was known from only fragmentary material. Still, there is plenty of information that fits in with modern conceptions of dinosaurs. In 1980, the dinosaur renaissance was gaining good speed, and the text reflects it, dealing with questions of dinosaur metabolism and feathery adornment. Deinonychus, that key figure in the dinosaurs' PR makeover, receives well deserved space, though it's not so radical as to suggest the iconic dromaeosaur may have been feathered. Still, there's no mistaking that it was seen as a vicious little beast. Swan's color palette combines muted earth tones with warm oranges, pinks, and yellows, with pops of color bringing dimention to the diorama-like composition of her mesozoic scenes. This one, from the Late Cretaceous, really drives home the idea of how much the world was changing. The bright pink flowers, set against neutral greens and browns, hint at how much they were changing the course of evolution. I suspect that this Susan Swan is the same as the prominent illustrator who works in cut paper, but she doesn't feature any watercolors on her site, so there is a chance that this is just a coincidence. For more watercolors from this title, hop on over to the Vintage Dinosaur Art Flickr pool.